The Row was abuzz with partygoers shifting in and out of pulsing houses along the half-mile stretch of fraternity homes on 28th Street. As the clock inched toward 12 a.m., the Thursday night festivities were approaching their enforced conclusions. Sophomore Katie McCool was tired. The night had been long, there was class for her in the morning and she was ready to go home. But as she was about to leave a party with a group of friends, she noticed a girl in the hallway struggling to stand. The girl was alone, disorientated and nearly unconscious. A small crowd formed. People debated calling for help: DPS, 911, a roommate. McCool and the group eventually agreed on a happy medium; They phoned student EMTs, who, upon arrival, said she was well enough to be taken home. McCool and one of her friends tucked the girl into an Uber, eventually putting her to bed and in the care of her roommate. The girl eventually recovered, but throughout the night, she vomited, sweat through the sheets and foamed at the mouth. These are symptoms of alcohol poisoning, which can be a lot more serious than just a brutal hangover the next day. 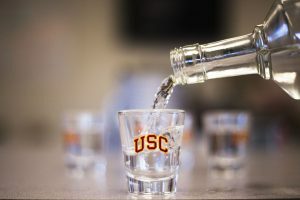 As the University continues to rise into the upper echelons of academia, a lingering challenge remains as to how to break up a stubborn binge-drinking culture that is putting students’ lives at risk not just on the Row, but all throughout the campus community. Binge drinking, typically classified as having five or more drinks in a short period of time, has long been a staple of a college culture where students will drink to dangerous extremes. 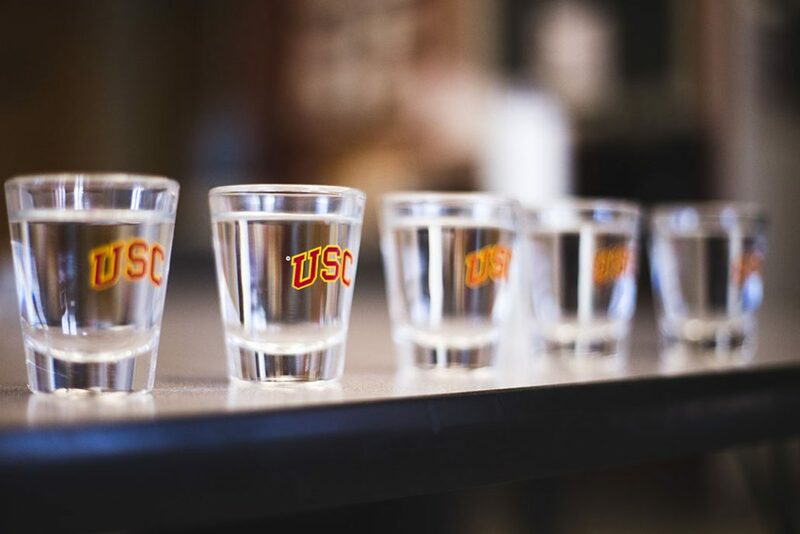 USC is no exception, and it is the leading cause of Trojans being sent from late-night parties strewn around campus straight into the local emergency room. “When we look back at the data, we see a growing number of students who are being transported to hospitals over the past 10 years for the overconsumption of alcohol,” said Ainsley Carry, vice president for Student Affairs. Data collected by the University since the early 2000s show that the numbers of undergraduates participating in “high-episodic” drinking — defined as the consumption of five or more drinks for males and four or more drinks for females on at least one occasion in the past two weeks — is both above the national average and rising. 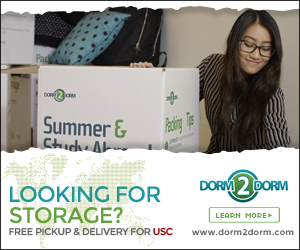 According to the 2014-2015 Impact Report compiled by AlcoholEdu for the University, nearly a third of the USC student population had binge drank within the past two weeks during the fall semester, a four percent increase from 2006. Not surprisingly, then, a steady stream of underclassmen is being rushed to hospitals after overestimating their drinking limits. In just the first few weeks of this school year alone, there have been nearly 50 alcohol-related medical transports on and around the University Park Campus. The mass majority of those incidents have involved underage, first-year students. It’s an issue that has severely gripped the attention of campus administrators and student groups alike. The overarching theme of their efforts is clear: stop the fringe culture of binge drinking in its tracks. From the Impact Report, of the nearly 3,000 students that arrive on campus each year, 59 percent come in as non-drinkers – meaning they haven’t had a sip of alcohol in the past two weeks, a 6 percent increase from 2006. Abstainers, or those who haven’t touched a drink in the past year, make up 29 percent of that. But by 45 days into the semester, that first group is down to 44 percent. The abstainers? Decreases to 24 percent. Somehow along the way, students are picking up a drinking habit, and in dangerous amounts. Binge drinking, too, jumps from 21 percent to 32 percent. For administrators, the key to maintaining these “non-drinkers” is offering programming that doesn’t center on alcohol. If the student doesn’t drink, ‘Good,’ they say. Their mission is to provide an alternative so the pressure to go out and party dissipates. “Residents tell me they are not a huge drinker or partier, but that’s the only way to hang out with their friends in that group,” said Heather Lee, vice president of advocacy for Residential Student Government. “The idea is that partying is the primary social event, and if you don’t do that, there’s no way to hang out. To combat these residents’ preconceived notions, the Office of Residential Education rolled out “Cardinal and Gold Events” last year, which are late-night, alcohol-alternative functions Thursdays through Saturdays. And so far, they’ve been quite the success. ResEd Director Emily Sandoval couldn’t help but smile when describing a Pinterest-themed craft event this month that had more than 200 people in attendance – on a Friday night. 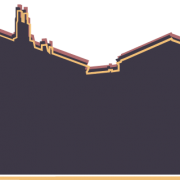 Those Cardinal and Gold events have been supplemented this year with Late Night ’SC, programming offered to all USC students, not just residents, that also offers non-alcohol-centric events during prime social hours on Thursday, Friday and Saturday nights. And this year’s expansion of programming for student housing, or “Residential Colleges,” is envisioned as a way to provide a social community for students with events that aren’t about alcohol. The crux of these efforts is to normalize non-drinking behavior before it starts. When Swinford from OWHP speaks about drinking’s effects on young college students, her characteristically cheerful demeanor stiffens. Working at the University since 1987, she’s witnessed the worst possible outcome of binge drinking. For her, it’s all about education — convincing students that there are more consequences to drinking than just a nasty hangover. The neurological damage is what worries her. Advances in brain science have shown, Swinford said, that the human brain goes through as much change between the ages of 19 and 24 as from birth until 5 years old. “If we are going to really provide an elite educational experience, we have to be up front how you are messing with the equipment if you’re drinking,” she said. Swinford, of course, understands the reality. Students coming to this university will drink, as they have in the past and likely will into the foreseeable future. But in her ideal world, it’s not really about educating young students how to drink, but rather, how not to. The question remains, however, on what to do about the students they can’t save right away, the students who just can’t seem to stop indulging in dangerous drinking behavior. “We know it will happen, so we want to find out what is the desire or the culture that pushes people to drink alcohol to the point where they’re unconscious,” Carry said. This is Carry’s ballpark. For him and his department, it’s about providing policy and environmental changes to the campus that will help students who have drunk too much, while also empowering them with the skill development to monitor their own behavior. In 2013, Student Affairs implemented an amnesty policy, which said if a student calls for medical help relating to underage drinking, they won’t be sanctioned. It then updated the social events policy, which hadn’t been touched much since 1992, with the realities of student behavior. Changes included extending Thursday night events to 12 a.m. and weekend events to 2 a.m. The thought behind the change was that students were drinking faster to beat the prior deadline. With a later party, hopefully, that behavior is more drawn out. 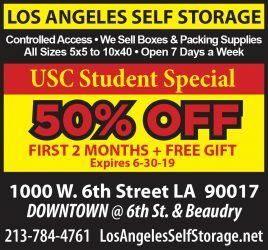 And those free USC Ubers, rolled out in fall 2014, were about more than just getting students from one block of campus to another. With average usage sitting at roughly 13,000 rides a week, the goal is that it curbs the desire to drink and drive. Its use is not always about alcohol, but that’s all right, Carry said. If it can help during a pivotal moment, it’s working. The Greek community has also received a renewed focus. Both the Interfraternity and Panhellenic Councils are continually working with administration to combat the dangers of underage binge drinking that can plague their social events. For example, this semester, Panhellenic has offered chapter programming to supplement AlcoholEdu, discussing the underlying dangers and causes of binge drinking, as well as augmented partnerships with campus health and wellness organizations. Last semester, the Fraternity and Sorority Leadership Development updated an 11-page list of regulations for Greek-related social events. In particular, Row parties that serve alcohol must have a guest list approved 24 hours in advance, specifically mark underage drinkers, serve only beer and wine, hire a security guard for every 50 people present and limit men and women to within public areas of the party until 8 a.m. the following morning. Questions do remain on the enforcement of such social event policies. Girls in attendance at these parties have reported the veiled inclusion of hard alcohol and the spotty screening of underage drinkers. And when partygoers’ hands are Sharpied with a black “x,” they can often be quickly wiped off or ignored by fraternity members tending bar. In a statement to the Daily Trojan, IFC said policy violations like these are strictly enforced by the OFSLD, the IFC judicial board and the Department of Public Safety. They stressed the many problems from binge drinking stem rather from “pregaming” Row events. “This is an issue which we, in partnership with all other councils, are working to solve with the continued enforcement of the Event Registration guidelines and renewed commitment to wellness education,” the statement read. But such actions are not limited to the Row. Without such explicit restrictions, off-Row events allow an even greater access to hard alcohol and tacit approval of underage drinking. Parties lining nearby streets like Menlo Avenue and Ellendale Place too feature irregular ID checks with much less University regulation than the Greek community faces. 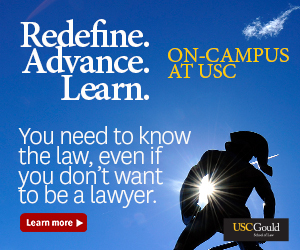 These issues — both after-hours and off-campus — are far from the field of vision of campus administrators. There is the belief, then, that some responsibility must lie on the student for the spaces administrators can’t reach. The idea is that students must want to change. Above all else, safety and health are the top priorities among administrators and student groups alike. The thought is that it is better for a student to get help if necessary, than end up sick and alone like the girl sophomore Katie McCool found on that unfortunate Thursday night. And for those non-drinkers, empowering them from a silent majority into a University norm is ultimately what the school hopes to achieve.